Most of us probably can’t remember being taught how to read with flashcards since it is a favourite of teachers in the early grades. But flashcards have been used by teachers for a long time, whether to teach the alphabet, numbers, words or math facts. As a parent, you’re likely to be familiar with it as you’ve probably used flashcards to teach your child the alphabet and numbers. There never seems to be research into why and how it works but teachers knew instinctively that flashcards work. It has only been in recent years that we are beginning to understand the science behind flashcards. Parents and teachers who are opposed to the use of flashcards object to the tedium of drill and practice for children. But it is this drilling method that helps children to learn as recent research has found that it is effective for teaching phonics, new words and multiplication facts. Not only do young children benefit from the use of flashcards but older students do as well. In recent years, more research had been conducted on the use of flashcards by university students to study for exams. Not surprisingly, those who used flashcards did better on their exams than those who did not. So why then do flashcards work so well? The explanation is that it is a tool to activate memory recall. When students see what is on the flashcard, they ask themselves what it is then they run it through their memory to try to correctly bring up the information. With young children, we teach them the unknown letter or word by showing the card and modelling how to read it then we ask the student t read it. When all the words are taught, the cards are shuffled and we ask the student to recall what’s on each card. For older students, when they study for an exam, they write a word or question on one side of the card and the meaning or answer on the other side. They shuffle it up and randomly select a card and either read the question and recall the answer or read the answer and recall the question. It is important to note that flashcards work better when used as a testing strategy rather than a studying strategy. What this means is to use the cards to test memory recall rather than to relearn the information by rereading the cards. I’ve realised this myself when I was in university making notes on cards and rereading the information over and over again. I realised that this didn’t work so well as when I tested myself on what I had written on those cards. It’s this act of recalling information that improved my studies. The other important thing to know is that flashcards only work for the short term. 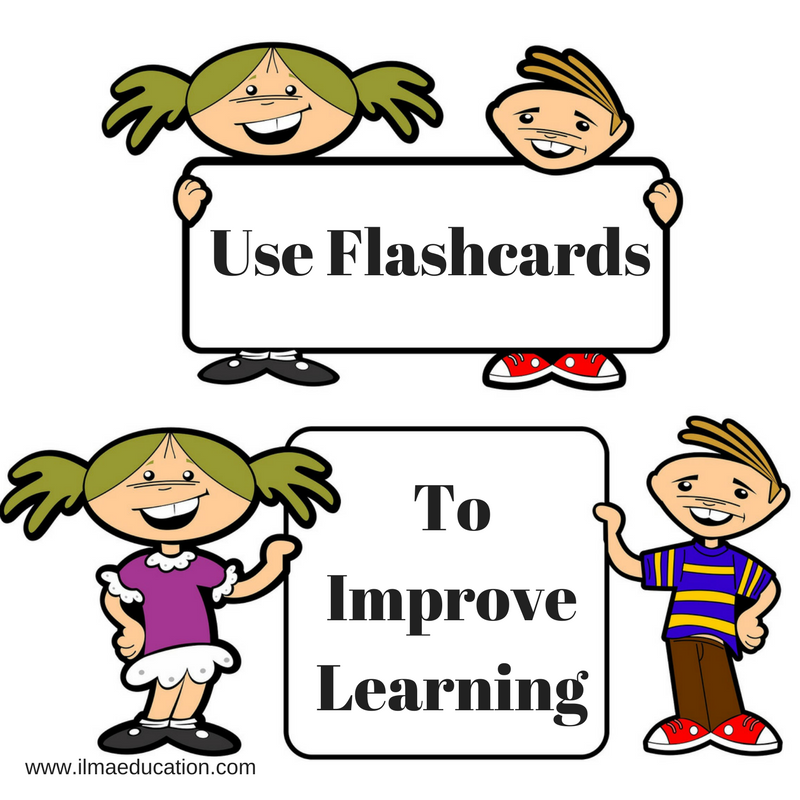 Have you ever noticed that if you’ve taught your child something with the flashcard and then don’t use it again, your child will have forgotten it after a few days? Or if you’ve studied for exams and straight after you didn’t looked at the cards again, you’d have forgotten what was studied? For new information to go into long term memory, you need to recall the information and use it until it becomes ingrained. It might be fine to forget what you’ve learnt for your exams but for young children they need to retain the skills they’ve learnt so they can progress to the next level. This is why I always retest children every day. If they’re learning the letter a, I would hold up the a card every day and ask them, “What’s this letter/sound?” to help them with recall. I have parents whose child only comes one day a week and they wonder why their child doesn’t learn. I tell them that the child needs to practice every day. 1. Write down on the flashcard what your child need to learn. 2. Write down only one letter, one word or one main idea on each card. 3. If it has an answer then write the answer on the back. You could do this for word meanings, multiplication facts, math facts. 4. Gather the cards, shuffle them and teach your child. Model it. 6. Ask your child to recall the answer. 7. You can prompt your child if she can’t recall. 8. Do this every day. 1. Write down on the flashcard what you need to learn. 2. Write down only one word or one main idea on each card. 3. If it has an answer then write the answer on the back. You could do this for new terminology or concepts. 5. Try to recall the answer. 6. You can prompt yourself by looking briefly at the answer. 7. Do this every day.